Anyone else obsessed with the 'Great Homes' slideshows on the NYTimes website? Well, if not, you should be. It will make you feel somewhat inadequate, because most of us haven't yet restored a 400 year old russian chateau, but it is great eye candy. 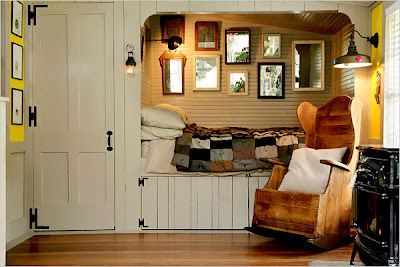 This little guestbed/nook and the collection of mirrors is my kind of thing.